So finally today, Naomi and I visited the zoo and it was a beautiful sunny day! A mom I’d met at church had invited us to meet her and her 2 year old daughter Audrey at the zoo this morning. I was a bit anxious the day before – we were going to have to get an early start to meet them there in time, the forecast was sunny so experience told me to expect bad weather, etc. etc. But the weather was, as the Aussies say, “glorious,” and we had a really great time! 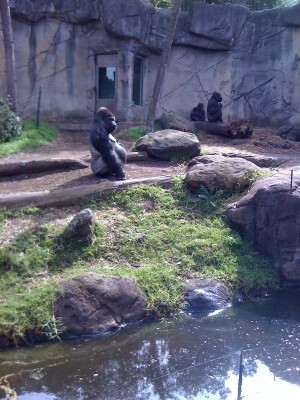 It was so much fun to get out so early in the day and to arrive at the zoo right as it opened. Naomi had so much fun with Audrey, and talked about her a lot later in the day, which shows me just how much fun she had. It did my mama heart so much good to see her giggling and running with another little girl again. I’ve felt sad for how much she’s missed her wonderful little friends at home while we’ve been here. She had played with Audrey several times at creche, which is I think part of why she seemed to connect with her so quickly today. And I had a really good time getting to know Anna, Audrey’s mom, better. Our first stop was unexpectedly the reptile house – not what I would have imagined the girls would ask to see, but when we passed it on the way to the monkeys, there was a giant bronze statue outside of a lizard, and they were both interested in touching that, so we made our way inside. They loved it! They got to see lizards and iguanas eating their breakfast right next to the glass, and I got to see a Komodo dragon for the first time (it was Naomi’s first time too but she was not interested in it beyond noting that he was “ni-night” [sleeping]). There were even two large pythons slithering around in water – she was intrigued by them. The best part of the reptile house were the hanging strips of heavy plastic from the top of the doorframe at the entry and exit, which made it thrilling to run in and out (and in and out and in and out again). Dude. That mommy has some killer biceps. After that we headed toward the petting zoo, but on the way we saw beautiful ring-tailed lemurs (just another kitty cat if you ask Naomi or Audrey), a big male elephant (of course, when Anna said it was “the male elephant,” I thought she’d said “mad elephant”, because of the accent… I also thought her husband’s name was “Mike” not “Mark” as it really sounds exactly the same in Australian), and even got to see some gorillas. The gorillas were very interesting to Naomi, and must have been one of the high points of her day, as she talked about one incident in particular for the rest of the day. What happened that captured her attention was that one of the younger gorillas was playing tricks on the older gorillas: he sneaked up behind the alpha male (who was absolutely mammoth and pretty scary) and tapped him on the shoulder before quickly scampering off, prompting a swift turn of the head and a stern grunt from the older male. 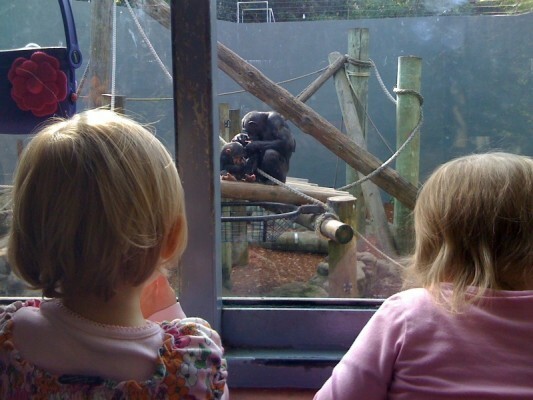 Then the little squirt ran up to a female gorilla and attempted to steal the banana she was eating. The female actually belted him across the face, and chased him around the enclosure, wrestling with him multiple times before he succeeded in escaping with the banana. Well. Naomi was pretty excited about that. I had been narrating for her, to keep her from getting too scared, and I had explained that the baby was trying to take the mommy’s food and she was saying, “No! That’s my food!” As the events unfolded, Naomi exclaimed a LOT, and after it was all over, she retold the story multiple times before we left the gorillas. And again when we were waiting for the ferry. 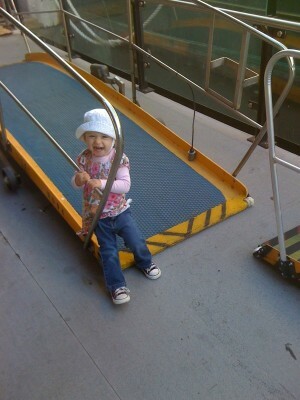 And again when we were on the ferry. And again when we got home to Daddy. It might just be that she likes saying, “No!” really emphatically, but I think it was kind of an exciting thing for her to see them quarreling like that. So anyway, we had a great day. Although you can’t tell by Naomi’s face in the next picture. 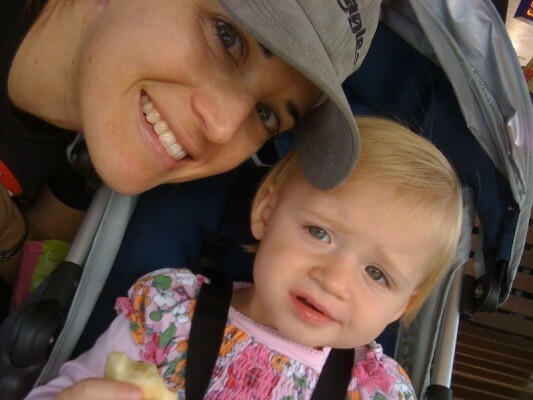 Naomi and I on the way home from the zoo, sharing an apple. 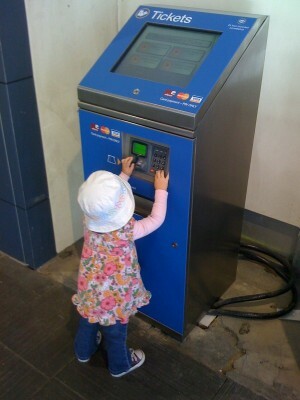 Where toddlers buy ferry tickets at Circular Quay. Actually, I'm not sure why this machine has a keypad at that level, but it made a great toy for Naomi! Hanging from, swinging from and climbing up poles is one of Naomi's newest hobbies. 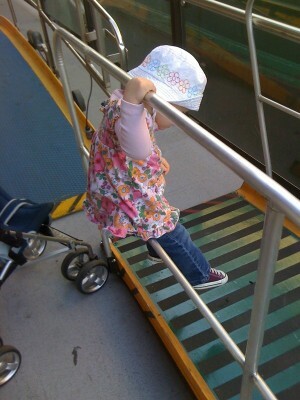 This unemployed ferry ramp entertained her for a long time as she climbed all over it. 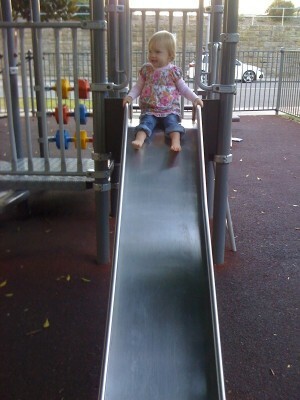 We are all loving the weather lately - warm enough for bare feet at the park later in the day! Thanks for all your encouragement, prayers and well wishes. Today was a good day for the culture shock adjustment process. Awesome . . . any chance of capturing her telling the story on video? I’d love to hear her version. Can’t wait to squeeze my little girl. 9 more days till we leave! Great idea Mom – I’ll see if I can get that. Can’t wait to see you guys! 9 days sounds so soon! I love the caption under the Chimp pic! “DUDE. That Mommy has some killer biceps.” So glad you guys had a good day! So glad Naomi has a new little friend too!